I don’t know whether to praise or curse whoever created the mug cake. The dorm room special soon trickled down to middle-schoolers through Wengie videos or some such rot, so much so that my own middle-schoolers can make a mug cake at the drop of a hat. And they often do, when they have a new babysitter or a sleepover or something. 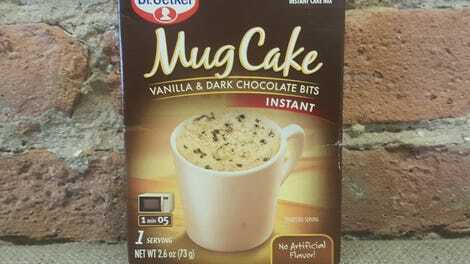 I’d never tasted one before, so I couldn’t really see the appeal, but believe me when I say that every 11-year-old I know is straight-up ravenous for a microwaveable cake in a mug. My daughter enthused, “One of the best parts of mug cake is that you don’t even need to bake it if you don’t want to, because the batter doesn’t have raw eggs, and it still tastes great.” Apparently she has inherited my love for cake batter and cookie dough, and hopefully my skill in avoiding botulism so far. So when I saw a mug cake mix at the grocery store, I was curious: Isn’t the whole point of mug cakes that they’re supposed to be super-simple? Did you really then need a mix for a mug cake? 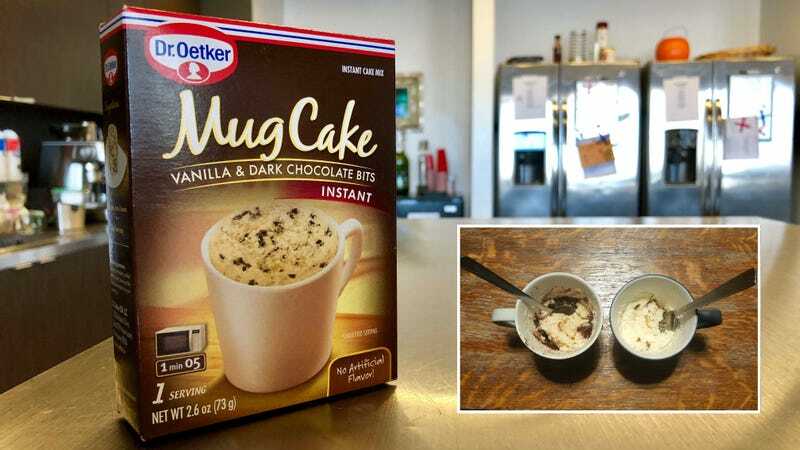 Sure, it came from the mysterious Dr. Oetker (a popular baking company in Germany, as it turns out), and adding the word “instant” to a mug cake mix seemed redundant. But since my kids (11-year-old boy-girl twins) were such experts, I thought it would be fun to try at home and compare. To add a degree of difficulty, I went with the vanilla mug cake mix with some chocolate crumbles. To recreate it, the kids were forced to fortify their recipe with chocolate chips like total troopers. Let’s see what happened! As we learned recently with brownies, homemade is always better. As we prepared the mixes, my daughter noted of the boxed version, “The mix smells super-artificial and too much like frosting. And not good frosting.” One thing both preparations had in common though: Make sure you use a big enough mug or else the cake will explode (at least 16 oz.) and grease the mug with butter first, to prevent yourself from having to spend the rest of your life cleaning it out. When we put the mix side-by-side with the from-scratch version, they looked similar. I began to see the beauty of the mug cake, because it got surprisingly fluffy and dense after just a minute or so of microwaving. And in both cases, the heavier chocolate parts sunk to the bottom of the mug. But the artificial flavors really did a number on the side-by-side taste test, according to my harsh pair of critics. “Like ‘Carrots For One,’” agreed my daughter, throwing out a Zootopia reference. Plus most mug cake recipes are so unbelievably simple, it makes little sense to spend extra coin on a mix that isn’t going to taste as good just to save a few minutes (really, minutes, tops) in the kitchen. Melt the butter in a microwavable mug and add the water and vanilla extract. Then add the flour, sugar, cocoa powder, and a pinch of salt. Stir together until mixed well and nuke in the microwave for 40 to 70 seconds, depending on how baked you want it to be.